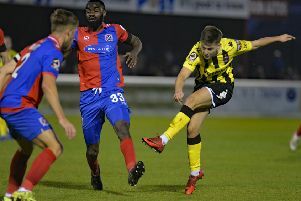 Dave Challinor admitted going through a full gamut of emotions at Wrexham and enduring an anxious final few moments, after Dover’s stoppage-time winner at Woking meant Fylde needed to hang on for a draw to secure their play-off spot. The Coasters boss said: “We weren’t great and it was frustrating at times. As much as we tried to drive home the importance of winning the game, I think there was a human tendency to think a draw was enough for us and that showed in our play. “We some good chances, particularly a couple in the second half, when I couldn’t believe we didn’t score. “The final whistle was a huge relief and now we have to prepare for Boreham Wood on Thursday. “We want to play better but ultimately it’s purely about winning at this stage. “They were the first team we met this season and I still keep in touch with their manager (Luke Garrard), so it’s funny how it has worked out. We both wished each other the best before the game but never really expected to draw each other. “Thursday night is a one-off game in a unique environment and people will be tested mentally.